Despite many West European preconceptions, the Near/Middle East was not a backwater of the world in the seventeenth century. In fact, three of the greatest empires (Ottoman, Safavid and Mughal) known to world history existed in the Near East and Southern Asia at that time, and it could be argued that all three were near their peak of cultural influence and political power--far more powerful than any country or kingdom existing in Western Europe in the seventeenth century. Scholars often use the term "gunpowder empire" to describe each of these three empires, focusing attention on their military exploits, which were, indeed, impressive. Each made use of newly-developed firearms, especially cannon and small arms, to create their empires. And to equip their armies, each state developed a highly centralized administration that could mobilize the financial, manpower and natural resources necessary to purchase gunpowder arms and then supervise the deployment of those arms and the training of soldiers to use the weapons. But all three empires were also centers of impressive cultural (artistic, literary and architectural) achievements. In addition, each was also all based on Islam in one form or another. In the Safavid Empire, for example, it was Shah Ismail I who really established the Shiite faith as the dominant religion of Iran/Persia. The Safavid Empire of Persia was a gunpowder empire set up by Shah Ismāīl I in the early sixteenth century. 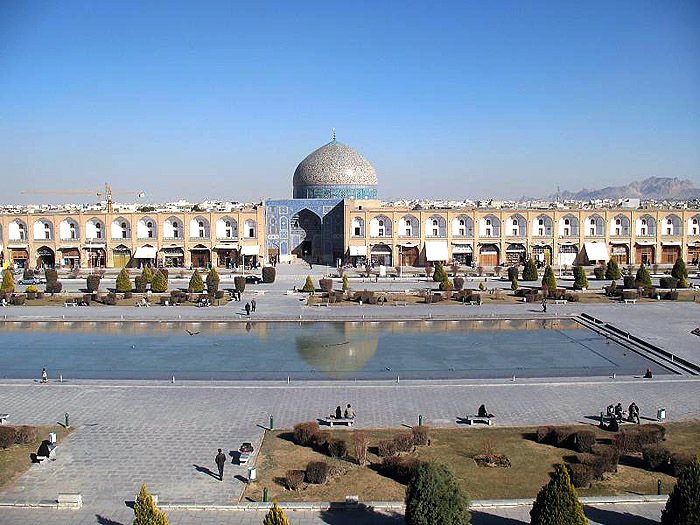 The Empire, based at Isfahan, lasted until 1722, reaching its height under Shah Abbās the Great, at the beginning of the seventeenth centuries. Curiously, Shah Abbās used the help of an English soldier-of-fortune to help him reorganize and train his army. He then went on to expand and solidify his empire. The Mughals--The word "Mughal" (sometimes "Mughul") is a corruption of the word for "Mongol"--led one of the world's most powerful empires. Babur (1483-1530), founder of the dynasty, led the invasion of India from Central Asia, a traditional invasion route that passed through Afghanistan. Despite overwhelming odds against him and only modest military means, Babur was able to consolidate power in Central Asia before capturing Delhi in 1526. His grandson, Akbar (1556-1605) was truly one of the greatest rulers that the world has ever known. He ruled with a legendary sense of justice/fairness and had the unique ability to fuse together competing customs and religious traditions, which was no small feat on the South Asian subcontinent. The Ottoman Empire, often most familiar to students of Western European history because of the long, close contact between the Ottomans and Europe, lasted the longest of these three empires surviving all the way into the twentieth century (1299-1922). The Ottoman capture of Constantinople in 1453 finally brought an end to the fading glories of Rome and firmly cemented the Ottoman Turks as the power in the Eastern Mediterranean. Expansion continued through the sixteenth and seventeenth centuries under sultans such as Selim I (1512–1520) and Suleiman the Magnificent (1520–1566). At its zenith, the empire controlled North Africa, most of the Eastern Mediterranean and also Eastern Europe and the Balkan Peninsula. In the last century of its existence, Western European diplomats began to call the Ottoman Empire the "the sick man of Europe" as it battled against nationalist uprisings in much of its territory and faced internal corruption problems. It seemed rather strange to me that despite my familiarity with the term "gunpowder empire," there was very little in terms of academic discourse about that phenomenon on the web. I knew that I had encountered the term years ago in the small pamphlet published by the American Historical Association (William McNeil, The Age of Gunpowder Empires, 1450–1800). I also knew that I had repeatedly encountered the term in world history textbooks, where it is widely used, and I am also aware that supposedly Marshall Hodgson, the outstanding historian of the Islamic world, is credited with inventing the term, but I remain surprised that there has not been much extended debate over the terms and boundaries of the phrase "gunpowder empire. ".